Dry weather is likely to become a more frequent occurrence in the future due to the impacts of climate change. This Spring’s intense dry spell is a sign of things to come and water companies need to be prepared to avoid water shortages, Environment Minister Lord Henley warned today. The recent dry weather which saw just 24 per cent of the average rainfall for April is likely to become a more frequent occurrence in the future due to the impacts of climate change. Therefore long term planning is needed to ensure sufficient water is available during hotter, drier summers. Lord Henley issued the warning as Defra published reports from each water utility company which identify the risks that climate change will pose to their service, and what actions they are taking to address them. It follows a drought summit called by Environment Secretary Caroline Spelman on Monday with water companies, farming groups and environmental organisations to make sure the country is prepared for the possibility of drought conditions following the long dry spell. Lord Henley was speaking during a visit to Rutland Water reservoir where he saw work done by Anglian Water to improve the resilience of their water supply. The East of England is the driest region of the UK, which last month saw just 5mm of rainfall - 11 per cent of the monthly average. Anglian Water has invested £116 million at Rutland for the construction of new pumping stations, a new water treatment works and 41km of pipes. It allows up to 25 per cent more water to be taken from the reservoir for people in Peterborough, Milton Keynes and Corby. The reservoir’s bird life is internationally protected so to prevent them being affected by any drop in water level the project also included a huge, 85 hectare network of new lagoons and wetlands to provide safe, top quality habitats for them and other wildlife. “Our region is on the frontline in the fight against climate change, with less rain than the rest of the country, a fast growing population and large areas of land below sea level. We must be ready to keep the taps flowing, despite the growing water scarcity which more people and less rain may bring. So, in addition to investment like that at Rutland, everyone needs to do their bit to conserve water and to treat it as the precious resource it is. The reports identify that less rain, changing rainfall patterns and increased consumer demand in hot weather could affect water availability and recharging of reservoirs, and more treatment will be needed for poorer quality water or to remove increased levels of microbials during high temperatures. Measures already taken include the construction of a West-East link pipeline by United Utilities to make it easier to transfer water across their supply area to meet demand, whilst Severn Trent plan to invest £202million between 2010 - 2015 to increase the security of water supply to 2.94million customers. Updated adaptation plans from 16 Government departments have also been published today, setting out what each department has and will be doing to prepare for climate change. 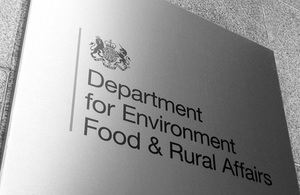 Over the coming months Defra will be publishing a total of 91 reports from major companies and agencies that provide other key services such as transport, energy and communications to assess their readiness for a changing climate. The reports will inform the UK’s first Climate Change Risk Assessment, to be published by Government in January 2012. The Climate Change Act 2008 introduced a new power for the Environment Secretary to direct companies with functions of a public nature such as water and energy utilities to prepare climate change adaptation reports on how they are assessing and acting on the risks and opportunities from a changing climate. Water companies plan for water supplies over a 25 year period through their Water Resources Management Plans. In their climate change adaptation reports, companies have broadened that view by looking at the risks from climate change across the range of their activities, from supplies to sewerage. Looking ahead enables the companies to adapt to climate change as part of their routine business. Environment Secretary Caroline Spelman held a drought summit on Monday attended by Water UK, the UK Irrigation Association, the NFU, Natural England, the Environment Agency, the Horticultural Trade Association, British Waterways and the department for Communities and Local Government.